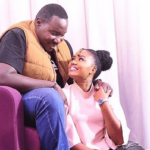 The new born in town is none other that Citizen TV´s Willis Raburu who saw his colleagues throw him a surprise bash. The 32-year old had his birth day in two unidentical parts and the obvious is a dinner date with his Love Queen. First, came in this facebook post from wife, Prude Raburu: Happy Birthday Opiyo. Please send him some love. You are loved Willis Breakthrough Raburu. What followed was a dinner date out at Four Points by Sheraton Nairobi Hurlingham, in Kenya´s capital: What stands out is the revelation made by the new born on his Instagram page: What a way to wrap my birthday up than to be at the place where it all began, where we first met…with #QueenRaburu @maryprude ❤ We wish the two well on this unparralelled but promising journey. The post Revealed: This is where King Raburu met his Queen appeared first on Ghafla! Kenya.